With the arrival of some warmer weather all of the cows are now back out at grass. Numbers have been increasing as we have had several calves born in the last week or so including the latest addition in the picture above. 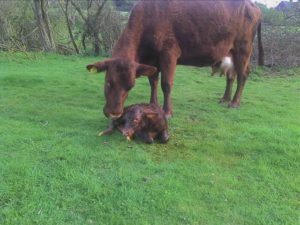 It is a heifer (female) calf and was only minutes old when the photo was taken and her mum , April, is licking her to clean her up and dry her. April is our oldest cow and will be 16 in July this year and has had 12 previous calves.